Let me admit - to begin with, I have just a collection of the pictures of my cakes baked and decorated over a period of time. I have never had the idea of putting them on a blog or any place else other than my Picasa Album. I take pictures of these things, to savor the taste and the visual appeal later. But I do intend to put in my dessert, snack and other recipes as my blog would be incomplete without them. Would also need to admit one more thing,the basic cake recipe I have used has been the same. There have been very few times, I have ventured to try out a new basic cake recipe. The others I have tried have not been entirely successful(palatable though), so those did not make to my make do, make believe turn table to don any decoration at all. But I have found that this recipe works quite well for me, as the cake tastes quite good. And once I have a decent basic cake, the decorating part is of paramount importance to me. Talking about 'inspiration', made this cake from Tarla Dalal's Cakes and Gateaux. 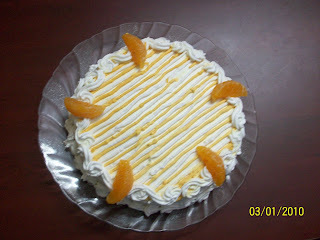 This was an Orange Gateaux for hubby's birthday.